MOSCOW, December 18. /TASS/. The Russian Strategic Missile Force will make operational 31 Yars and Avangard intercontinental ballistic missiles (ICBMs) next year, Defense Minister Sergey Shoigu said at the ministry’s year-end enlarged board meeting attended by President Vladimir Putin on Tuesday. "The Defense Ministry is set to accomplish several priority tasks in 2019," Shoigu said. "With regard to the strategic nuclear forces, 31 launchers with the Yars and Avangard ICBMs will assume combat duty in the Strategic Missile Force," the defense chief said. 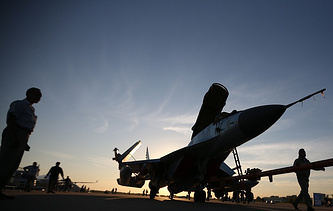 As Strategic Missile Force Commander Sergei Karakayev said in an interview with the newspaper Krasnaya Zvezda on December 17, the first Avangard missile complexes armed with the hypersonic glide vehicle will assume combat duty in the Dombarovsky missile division in the Orenburg Region in the south Urals in 2019. The new weapon was unveiled by President Putin in his State of the Nation address to the Federal Assembly on March 1. Initially, the UR-100N UTTKh (SS-19 Stiletto) missile will be the carrier for the strategic hypersonic weapon and later it will be replaced by the most advanced Sarmat heavy ICBM. The RS-24 Yars is a mobile or silo-based missile system with a solid-propellant intercontinental ballistic missile carrying a multiple warhead. The Yars was developed in the 2000s by the Moscow Institute of Thermal Technology under the supervision of Chief Designer Yuri Solomonov on the basis of the Topol-M ICBM.